Summers come to liberate you from those layers which keep you wrapped up in winters. But, summers bring with them heat lashes and with each day, the rising temperature. The rising temperature leads to rising tempers and bad moods. Well, the increasing temperature is a notification to prevent oneself from the heat waves and summer related distress. Both the day and night turn hot. We avoid going out, but, Being indoors all the time is also not possible. As we cannot do something about the climate, so the best way is to make something good out of the bad. 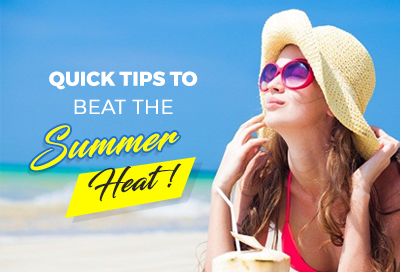 Let’s have a look at the points below to beat the summer heat! •	Lemonade, it’s the best of all. •	Gond katira: It is an excellent coolant and prevents Heat stroke and Nose bleeding in summers. Having gond katira in a glass of juice or slush before going out in summers prevents the body from any damage caused by heat waves. •	You can also have Coconut Water, Green tea, Juices, Slush. •	Local Indian drinks like Lassi, Ragi, Jaljeera, Aam Panna and Rooh afza. •	Water from earthen pots is cooler and better than the refrigerated water. Cold water tightens the blood vessels and makes us feel hotter. So, have cold water but not that cold. •	You can also add ingredients as Basil, Rose petals, Saffron and Cardamom powder to enhance cooling power of drinks. 2. Eat light: Excessive heat reduces appetite. But it’s important to take care of the diet, since the body needs regular nutrition. •	Have a light diet as veggies, cucumber etc. and avoid heat generating diet as meat, eggs, protein and even salt. •	Eat foods with high water content. Fruits like Watermelon, Cantaloupe, and Grapefruit etc. 3. Cold showers: Beat the heat with a cold shower. Always wash your face and feet with cold water before you go to sleep. However, wiping yourself with a cold towel will also help. 4. Keep low lights: Too much lights produces heat. Keep the light as minimum as required in the room and hang some heavy stuff curtains to restrict the heat inflow. It will help in creating a normal temperature. 5. Take care of yourself: Always put a sunscreen while going outside to prevent your skin from Sunburn. •	Use sunglasses when outside to prevent glare. •	Always carry a water bottle with you. •	Keep your head covered and avoid direct exposure to sunlight. 6. Stay healthy in summers: Avoid getting sick by Dehydration. Include fluids in your diet. •	Avoid eating from outside vendors. There are chances of contamination of fruits. •	Avoid caffeinated drinks, Alcohol. •	Avoid heavy physical workout in summers. You need energy to keep you active, so do not exert your body. And stay hydrated. I hope these tips will help you stay cool during the summers.